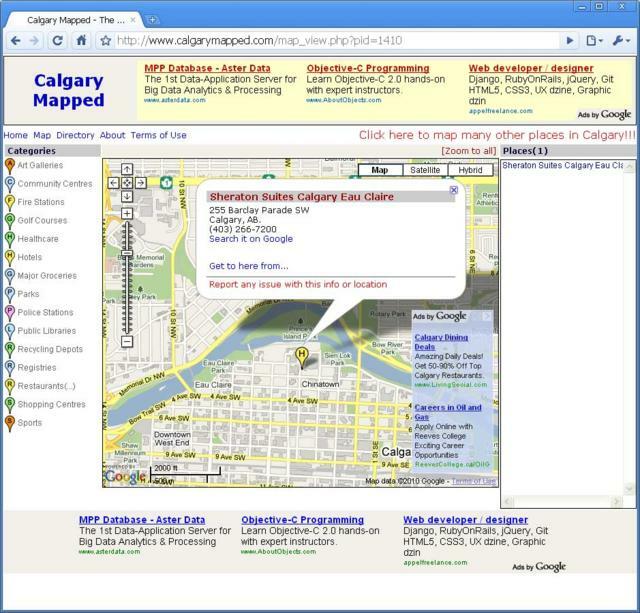 Just take me to the Interactive Map of Calgary with no places preloaded. Calgary Mapped is an application that using an interactive map allows you to locate (geographically) hundreds of places within the limits of the City of Calgary. For ease of use, the places are grouped by categories (e.g. hotels, parks, community centres, golf courses, libraries, sport centres, health centres, etc.) and each category is identified by a distinctive icon. Because mapping many places at a zoom level that shows them all can make the map too crowded with category icons, you can narrow your search to a city quadrant (i.e. Northwest, Northeast, Southwest, Southeast) For example, mapping all hotels in the Southwest of Calgary is hardly two clicks away! We were told never to trust a geocoder, so we didn't. The coordinates of every place in this site has been manually verified. Now, that proved to be a daunting task at times considering that Calgary is a huge(area-wise) city and continuously expanding. Some streets don't even appear in the map; therefore, we don't claim a 100 percent accuracy. Let's put it this way: If you are going to use the location where the place is mapped to send it a guided missile you will miss some targets, but if you are planning on driving to the place you'll most likely find it. Anyhow, if you spot a place wrongly mapped, please let us know here or from the place's info window you will find an option to report it, again just a few clicks away!